Why the hell is 37.5-point underdog Kansas on primetime national television this weekend? 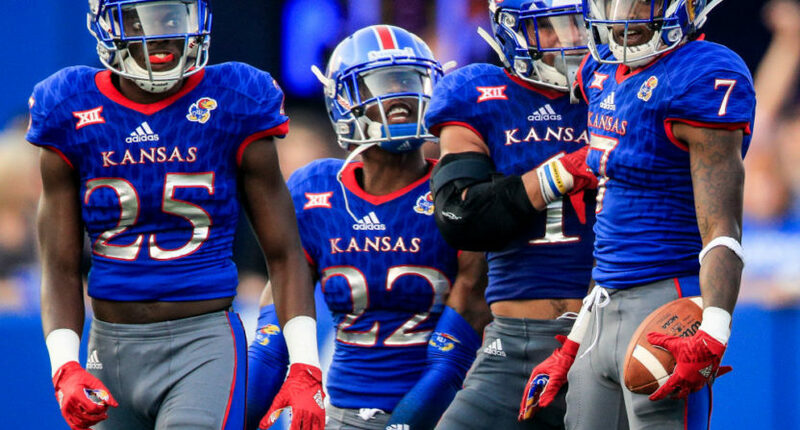 Kansas is a five touchdown underdog, and they'll be on in primetime this Saturday. Like so many Kansas Jayhawks football teams before them, the 2017 season hasn’t been very good so far. KU currently sits at 1-5, losers of five-straight following season-opening win over an FCS school. They’ve lost their last five games by an average of 28.6 points and are coming off a 45-0 drubbing by Iowa State. Aside from the November 4 showdown with 0-6 Baylor, there isn’t very much to look forward to this year and there’s little reason for national audiences to care about what happens. So how then is it that when you turn on FOX on Saturday evening, no matter where you are in the United States, the lowly Kansas Jayhawks will be playing a football game on your television? In spite of their putrid performance in recent weeks, Kansas will play the No. 4 TCU Horned Frogs on Saturday in what will be the Jayhawks’ first prime-time, nationally-televised game since Nov. 21, 2009. It’s also going to be their first national appearance on FOX since they played in the 2008 Orange Bowl, which feels like a millennium ago. Oh, and did we mention Kansas is a 37.5-point underdog on Saturday, the widest spread of any college football game between two FBS schools this weekend? So, again, of all the games that FOX could have picked to show the nation, why this one? The Topeka Courier-Journal reached out to Derek Crocker, senior director of collegiate sports for FOX Sports, who provided some reasoning for the selection. Technically, he’s right. Despite the fact that TCU has been generally very good and Kansas has been generally very bad since the two became conference-mates in 2012, the budding “rivalry” has produced a lot of reasonably-tight football games. TCU has won all five contests but the widest margin of victory was just 14 points (2012). Last year’s contest was a 24-23 squeaker and TCU hasn’t won by more than six points since 2013. Couple that with the results of last weekend, when multiple top-ten teams faltered against underdog opponents, and it looks like FOX is willing to gamble that lightning will strike for them as well. Of course, the process for how it’s determined which games are broadcast where is more complicated than that. The Big 12 partners with both FOX and ESPN, both of whom duke it out for priority in a process that sounds way more intricate than you might think it needs to be. Before the season even begins, the two national broadcast companies hold a “draft” to claim priority selections during each week of the conference season. Then, each network picks the specific games they want based on that order. This weekend, FOX has conference games while ABC (a part of ESPN’s deal) will air one. As the Courier-Journal figured out, that means FOX spent four of those offseason picks on games for Week 8. They asked, but weren’t told which network that the weekend’s No. 1 pick or where the Kansas-TCU game fell in that order. Once FOX knew they’d have four games this weekend, their executive team huddled last week to figure out how different scenarios might affect which games should be broadcast where. Normally, that decision comes down on the Sunday or Monday of the previous week. However, because there were so many high-profile Big 12 games last weekend, they used a clause in the contract to wait until six days before game day. The network can only do that four times in a given season, so they use them wisely. As Crocker told the Courier-Journal, from there the network can pick any game and any teams without concern for fairness or equality. They don’t need to make sure everyone gets a primetime slot, it’s entirely up to them, though he does allude to the fact that the conference makes their preferences known from time to time. There’s also another theory at play here. Kansas ended up in primetime because FOX looked around at the competition and realized they were better off putting their best games elsewhere. ABC will feature No. 19 Michigan at No. 2 Penn State, while NBC boasts No. 11 USC at No. 13 Notre Dame. Chances are that national audiences will be locked into either of those contests. So if that’s the case, why not go with a regional matchup to counterprogram against that rather than, say, No. 9 Oklahoma vs. Kansas State, which will take FOX’s 4:00 p.m. slot? However it plays out, FOX will probably come out of it fine. They don’t have a marquee Big 12 match-up to rival their competitors so it seems like a decent strategy. Plus, if Kansas does shock the world, they’ll look really smart for making the call to primetime. More likely, however, it’s a chance for the nation to see just what in the heck passes for football these days at KU.